The Lighthouse of Alexandria - one of the seven wonders of the ancient world - will be rebuilt at its original location, according to Egypt’s Supreme Antiquities Council that announced its approval. “Members of the Permanent Committee of the Egyptian Antiquities have approved an old project, submitted previously by the Alexandria governorate, aiming to revive the lighthouse,” Antiquities Council Secretary General Mostafa Amin told Egyptian newspaper Youm7. Research and the final construction plan have been submitted and now the final decision rests with Alexandria’s regional government, Amin said. 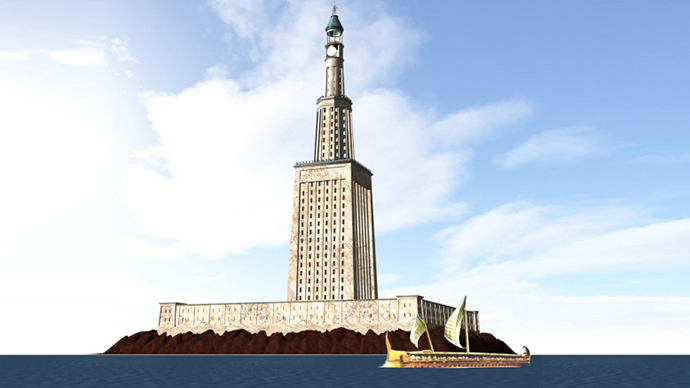 The Lighthouse of Alexandria, also known as the Pharos Lighthouse, was the first of its kind in the world and remained one of the tallest man-made structures for centuries — 450 feet tall (137 meters). It was built on the island of Pharos by the Ptolemaic Kingdom in 280 BC after the death of Alexander the Great. A series of earthquakes in the region caused the structure’s final demise between the 3rd and 12th centuries, the Cairo Post reported, citing the Greco-Roman archaeology professor Fathy Khourshid. “The original building comprised three stages: a lower square section with a central core, a middle octagonal section and a circular section at its top,” Khourshid said. The lighthouse used a mirror to guide ships during the day and fire by night. It was completely destroyed in the 14th Century and some of its pieces were used to build the Citadel of Qatibay in 1480, which is still part of the city’s landscape even today. New discoveries of the lighthouse’s remains were last made in Alexandria’s harbor in the 1990s.